PRESIDENT- Oversees all board committees. Acts as a liaison with the administration and represents Holmdel High School at the Superintendent’s monthly meeting. Prepares agendas and runs monthly meetings. Submits President’s message to newsletter. 1st VICE PRESIDENT/MEMBERSHIP – Assists and supports the president. Solicits parents and faculty to join the PTSO, collects dues and keeps records of PLG membership. Plans end of the year breakfast for PTSO board. 2nd VICE PRESIDENTS/FUNDRAISING – Coordinates and oversees all fundraising events for the school year. This includes Write-A-Check and any other fundraising events. RECORDING SECRETARY – Records minutes of monthly meetings, types minutes and reports them at the following meeting. CORRESPONDING SECRETARY – Responsible for all communication to and from the group. TREASURER – Reports at the monthly meetings the current balance and all the monies disbursed and deposited. Writes checks, makes deposits, balances check book and keeps ledger. Must also be available for major fundraisers and gifting committee. ARISE LIAISON: Attend monthly meetings and report pertinent information to PTSO monthly. BAKE SALES: Responsible for soliciting bakers and organizing monthly cupcakes sales. BOE LIAISON: Attend 2 BOE meetings per month and report pertinent information to PTSO monthly. BOOSTER CLUB: Attend and/or obtain summary of Booster Club meetings each month and report pertinent information to the PTSO monthly. CAREER DAY: This committee coordinates the Career Day activities, contacts speakers and plans the day’s format. DRUG AND ALCOHOL ALLIANCE LIAISON : Attend and/or obtain summary of monthly meeting and report information to the PTSO monthly. HISTORIANS: Should attend all school functions and take photos to be used in news articles. Posts pictures on bulletin board at school. HOLMDEL CREATIVE ARTS ASSOC. (HCAA) LIAISON: Attend and/or obtain summary of monthly meetings and report information to the PTSO monthly. 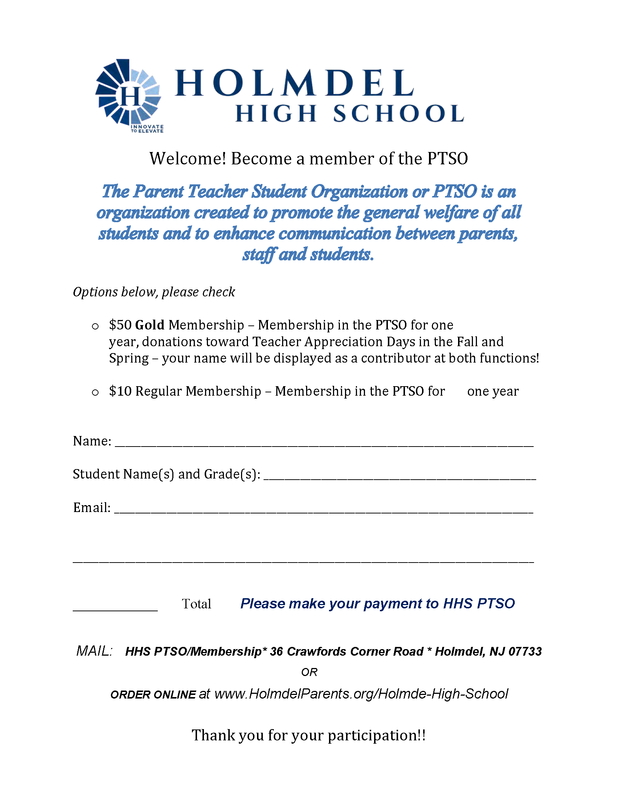 HOLMDEL FOUNDATION FOR EDUCATIONAL EXCELLANCE (HFEE) LIAISON: Attend and/or obtain summary of monthly meeting and report pertinent information to the PTSO monthly. HOSPITALITY: Responsible for planning teachers Fall Tea, teacher appreciation luncheon. Also sets up refreshments at PTSO meetings. OPERATION GET OUT THE VOTE: Involves the recruitment of volunteers to help the Superintendent’s office with phone calls to parents regarding the school budget vote. PHOTO COPIER: Collects change from PTSO copier, delivers to treasurer for deposit and reports to PTSO. PROGRAMS: Coordinates College Night at the PTSO Night meeting in November. 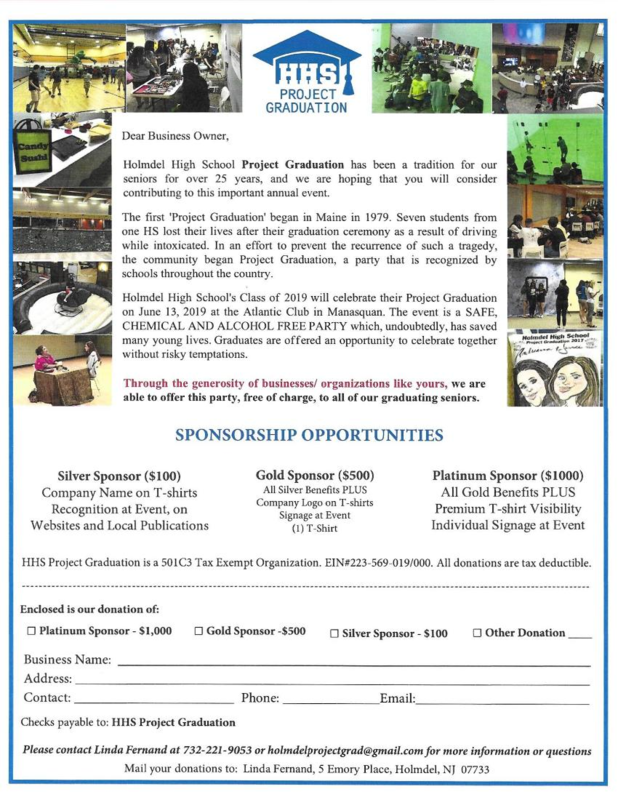 PROJECT GRADUATION: Coordinates all activities revolving around Project Graduation including but not limited to monthly meetings with the students, setting up the night and scheduling for the concerts at PNC Art Center. SPECIAL PROJECTS: Plan, coordinate and staff HHS activities at Holmdel U.S.A. Day. SPECIALIZED FUNDRAISING: Publicizes, collects and redeems Acme Tape Saver Program and other specialized programs. Also coordinates and publicizes One Cause Fundraising. STUDENT DIRECTORY: Responsible for distributing forms and coordinating and confirming information for inclusion in directory. SUNSHINE: Responsible for correspondence dealing with condolences, births and illnesses for faculty, students and PTSO members. Also responsible for Administrative Assistants’ Day, Librarians Day and School Nurses Day. WEBSITE: Updates the PTSO website.